Picture a workday where everything goes right. You walk into the office twenty minutes early, because your friend Saf tells you the usual route is blocked. As soon as you step into the office, she helpfully reminds you of all your tasks for the day. You almost forget the meeting you scheduled with the sales team, but Saf reminds you about it just in time. You don’t notice it’s lunchtime because you’re engrossed in your work, but she makes sure to remind you. You want to surprise your colleague on his birthday and Saf helps you plan the party. If you haven’t been living under a rock for the past year, you’ve probably already guessed — Saf is a bot. Chatbots have been part of our communication platforms for quite some time. You’ve definitely come across these conversational computer programs: they’ve helped you order a meal, book a cab, or even plan a vacation. According to the experts, private messaging apps are taking over social media platforms. For instance, Messenger, Facebook’s messaging platform, has over 900 million users and 100,000 monthly active bots. With one-on-one and group chat becoming the dominant method of communication, there are almost unlimited opportunities for bots to contribute. Let’s talk about how the bot revolution will impact your workflow and team productivity by automating tasks that you’ve been doing manually. In the upcoming posts in this series, we will discuss what lies ahead for developers, marketers, and businesses. The future of work is here. Are you ready? Chatbots first emerged, as the name suggests, in chat interfaces. They are powered by AI and machine learning, which enables them to simulate human conversations and learn from experience. Chatbots’ primary benefit is task automation: they can be programmed to do your mundane tasks for you. With time, they get even better at it, taking on more complex tasks with greater efficiency. Self-driving cars work on this same principle of cognitive technology. Some industry experts are even suggesting that chatbots may take over mobile apps. Now you can work on several different tasks within a single chat software rather than switching between apps. This is appealing to users because it allows them to cut down on app installations and signups, especially for apps they only use occasionally. How does all this translate to improved team productivity and workflow? With technology driven by AI (Artificial Intelligence) and NLP (Natural Language Processing) powering tasks that used to be performed by humans, organizations can now optimize their time and resources to get quality work done at greater speed and lower costs. Let’s take a look at KLM, an airline service that provides customer support through bots. The KLM support bot identifies passengers through their Facebook accounts to avoid having to ask for additional information like flight numbers. Bots can keep you updated on everything from weather updates to news alerts. They can go a long way in cutting your business spending while improving your customer experience. Many tasks are organization or role-specific — a sales agent will benefit from sales call notifications, while a CRM user would want easy access to all customer information. And this is where custom bot creation comes in. Custom bots let you tailor your chat experience to suit your individual work requirements. Using your chat software as a platform, you can develop (and subscribe to) the bots you need. At Zoho, we use Cliq’s chatbots all the time. When we identify a task that could be automated, we create custom bots using our in-house development platform, powered by Deluge. 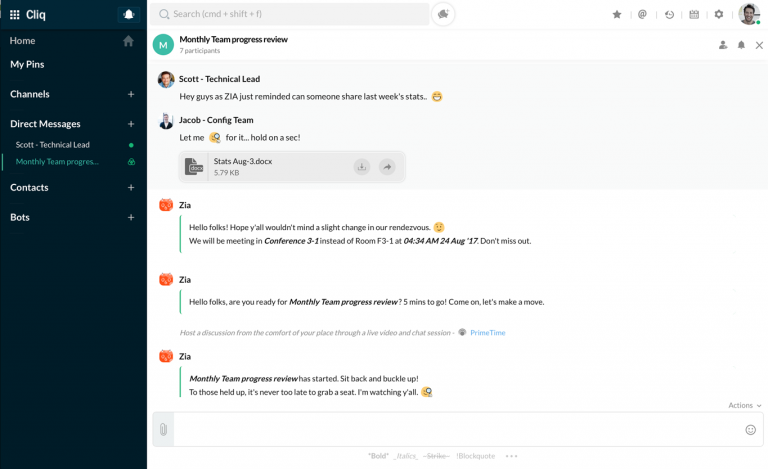 Taz is a friendly, well-rounded chatbot that sends out notifications and helps us create events and share files. Automate event scheduling: Mention Taz in your group chat and he will send out event invitations to all group members. 2. 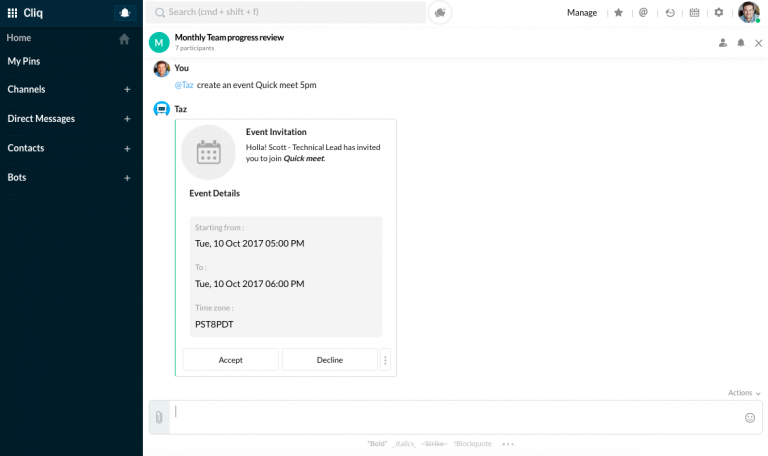 With the Zoho CRM bot, we access customer data and event reminders right within our chat windows. 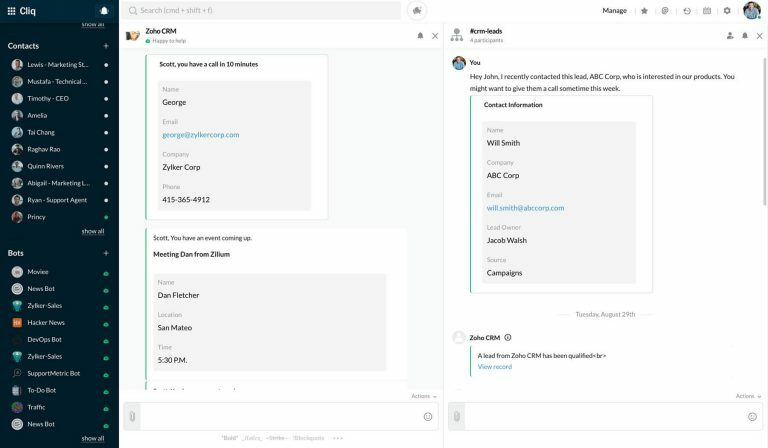 Real-time collaboration for your sales team: The Zoho CRM bot sends you reminders about upcoming calls, webinars and meetings. It also sends out real-time notifications about leads and potential clients through the handy SalesSignals feature. 3. Zia is Zoho’s intelligent assistant, powered by NLP and AI. She helps us plan events better by sending event notifications and reminders. Always be on-time and prepared: Zia will send you friendly event reminders and rescheduling notifications. 4. We use the Estancia bot to get updates on everything going on around our main office, from the lunch menu and team birthdays to traffic updates and cab booking options. Don’t miss out on office celebrations! See what’s going on right now within your chat. At the end of the day, chatbots are here to make your work life more human. They’re already helping you do more through conversation and collaboration, and the more they learn, the more you can do. In a chatbot-powered workplace, you’re at the center of everything — with your friends all around you. We’d like to help you make the most of it.